Pesto Pasta Primavera w/ Local Bread — Happy Food Co. BOIL salted water in a large pot over high heat. 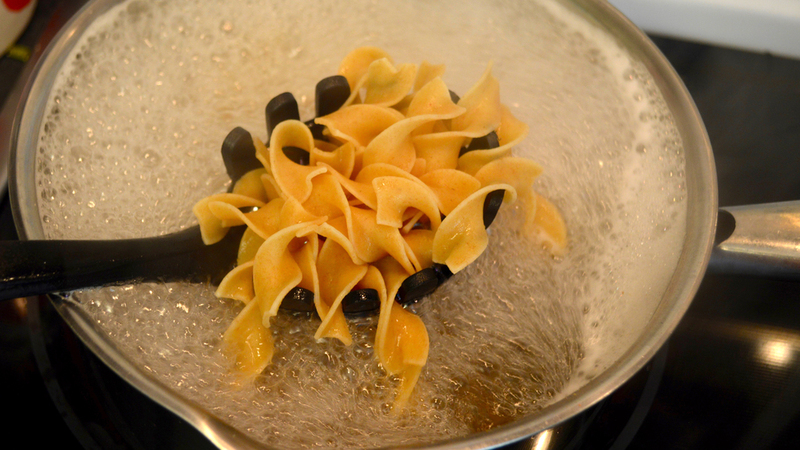 ADD the egg noodles and cook until al dente, about 8 minutes. DRAIN noodles after cooking in colander or strainer. HEAT the contents of the olive oil packets in a large skillet over medium heat. ADD the mirepoix and sauté until softened, a few minutes. ADD the mixed seasonal veggies. Sauté until crisp tender and tomatoes begin to burst, about 5 minutes. Season to taste with salt and pepper. ★ Mire-Whaaaaa? That’s mirepoix, pronounced “meer-pwah.” This is a fancy French word for diced veggies (typically carrot, celery and onion) that add a base layer of flavor. Mirepoix is typically cooked over gentle heat to sweeten and soften the dish. STIR in the spinach and garlic. COOK until the spinach is wilted but still bright green, about 1 minute. Turn off heat. ADD the drained noodles to the skillet. 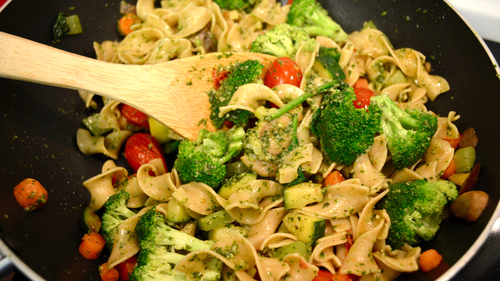 SPRINKLE pesto pasta primavera with parmesan cheese. SERVE with a side of bread and butter. Enjoy! This Chardonnay offers bright abundant aromas of baked apple and peaches, layered with buttery notes of toasted oak and caramel. The rich, creamy flavors are nicely complemented by a refreshingly crisp acidity, culminating in a smooth, lingering finish.